I’m a sucker for a good time travel novel. I don’t get wrapped up in the potential plot holes or let myself become confused by paradoxes. I just want to read about people messing around in the time stream and watch what happens. When I read Ann Brashares, author of "The Sisterhood of the Traveling Pants" series, had written a standalone time travel YA book, I was excited to get my hands on the audiobook. Prenna has traveled back in time to 2014 with her mother and a colony of others escaping the plague-ridden future. The colony follows strict rules so as not to raise suspicion among “time natives” nor modify the timeline in drastic and unalterable ways. Chief among these rules is no relationships with the time natives, only other colonists. This is a YA novel, so obviously Prenna falls for a time native, Ethan. Prenna starts to think something’s up with the rules and the severely strict regime under which she and the other colonists live. When a homeless man gives her a strange warning about things he couldn’t possibly know, Prenna and Ethan embark on a journey to fix history and prevent Prenna’s future from occurring. The love story is just a one part of the novel, and isn’t overwrought or distracting from the fast-paced thriller it becomes. The twists are genuinely surprising, and Brashares makes good use of the time travel concept. Like any time travel story, if you think too hard about the plot, you can spend hours thinking in circles. But if you just accept the premise and don’t worry about the details of the timeline, you’re in for a fun read. Verdict: Affirmed for YA & non-hard Sci-Fi fans. If you’re looking for your next read post-"The Time Traveler’s Wife," this is a solid pick. Non-YA fans might get a bit bogged down in the romance side of it, so if that’s not your cup of tea, look for something hard sci-fi. Narration was solid if you’re interested in the audio. 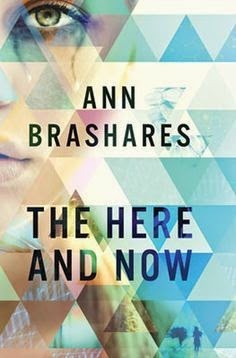 “TheHere and Now” by Ann Brashares, published by DelacortePress on April 8, 2014. Audio narration by Emily Rankin, published by ListeningLibrary on April 8, 2014.